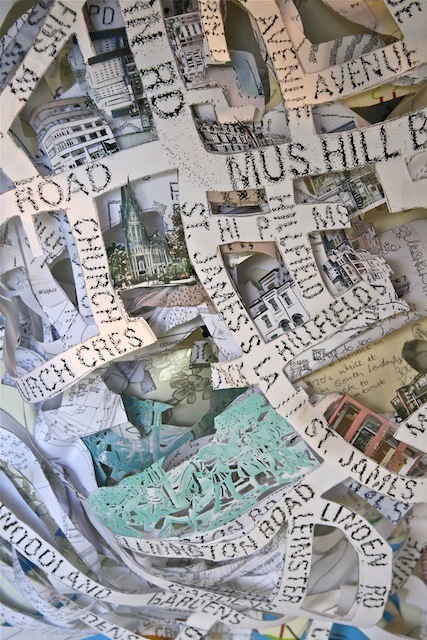 Anya Beaumont spent months crafting this exquisite collage of Muswell Hill. It's pieced together from dozens of sheets of paper, donated from various sectors of the local community, then intricately cut by Anya and assembled into a projection map of the area. 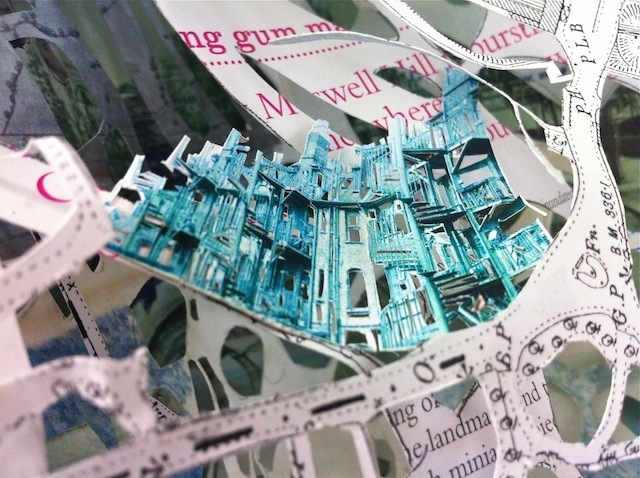 This incredible piece is currently on show at Muswell Hill Library on indefinite loan. The video below shows Anya talking about the project, and we also asked her a few questions of our own. The map collage is quite a novel technique. How did you come up with the idea? I developed this technique in an earlier mapping project - 'Paper Trail (100,000 Cuts) 2010-11, a site specific mapping piece I created for artsdepot in North Finchley. 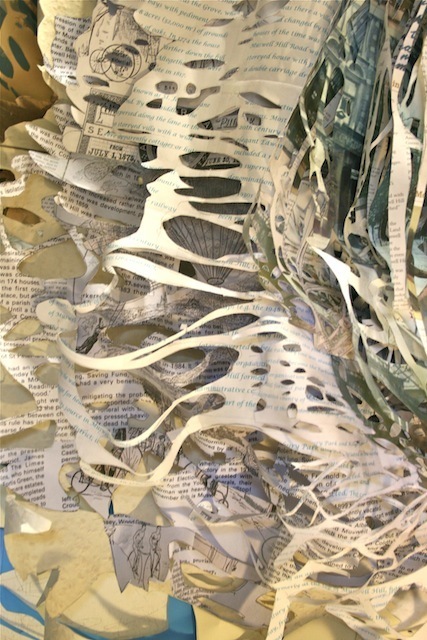 I wanted to work with paper and incorporate a shadow projection technique I had developed in earlier sculptures. Layering paper that had been donated by the community that lived or worked within the area the map was an ideal way of really siting the work there and using a sustainable source material. Now on permanent loan to artsdepot, the work is displayed in one of their public foyers. It looks like quite painstaking work. Did you ever accidentally tear something or mess it up and lose a few hours' work? The whole process was extremely painstaking! I was pretty careful with it overall, the main problems would occur when I just wanted to get on with the work but my blade had become blunt. Instead of stopping and getting a new one I would sometimes just push on and that's when the paper can start to tear. 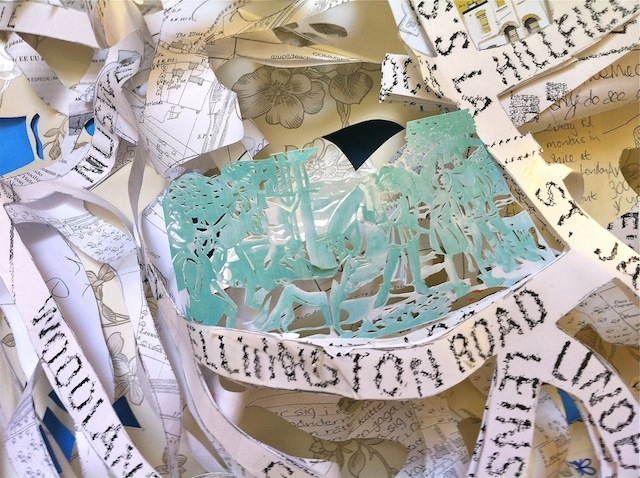 In 'Mapping Muswell' I used some old ends of rolls of wood-chip wallpaper, which was really awkward to cut, I did get through quite a few scalpel blades! How did the local community feed into the project? Initially, I contacted various local community groups including the Muswell Hill Traders Association, The Muswell Hill Sustainability Group, local schools and Surestart Centres and the local press. This was to generate interest in the project and put a call out for any unwanted paper I could use to make the work. The library was a collection point for people to drop their paper off. I also conducted a series of residencies in Muswell Hill, one at 'the Local Gallery', one at a school fair, another as part of the 'AP and Beyond' Festival organized by local arts group 'Everyones Climbing Tree' and another, longer one at the library itself. During these residencies, people had the opportunity to take part in an activity called "Map-Me", which involved drawing or writing something about themselves or the area on a piece of pre-used paper and then tracking this onto a map of the area with a piece of string and some sticky tack. The results were different in each venue. Some of these exercises were done mainly by children and they produced some lovely colourful drawings, but at the library it was mainly adults that participated and they chose to write about the area. This resulted in some intriguing musings. What was really revealed was how much people love the area. Once each "Map-Me" was complete, I posted images of it on the facebook page I had created and then used the paper again in the work. I also visited various groups and spoke about the project and showed images of the work as it was going along, some of these groups were residents at Hilldene Court — sheltered housing for the elderly, the Haringey Branch of the University of the Third Age, the friends of Muswell Hill Library Committee, Coppetts Wood Sure Start Centre. I also produced a limited edition book of the project, which shows some of the more interesting and unique pieces of paper that were donated to the project as well as details form the "Map-Me" activity and images of the work as it developed. And what was their reaction at the finished work? Overall, most people have been intrigued and excited by it, I have had some very positive feedback. It is big — approximately 7m wide and something very different for the library, which is rather traditional compared to some newer libraries. Did you learn anything about your local area by creating this art? So much! The residency in the library was brilliant for that. People who had spent most of their lives in Muswell Hill came and spoke to me at length and I found out about the development of the area and local attractions like the Athenaeum, which had been a dance hall but now is a Sainsbury's. I also found out my own house had been built by prisoners of war who had been billeted at Alexandra Palace. Needless to say, there were some grisly tales too, in particular a famous murder on Tetherdown that obliquely led to the areas development. Do you plan to develop the concept further — perhaps a whole London collage like Stephen Walter's The Island? Wow! Think of the cutting that would entail! It would be great to do the whole of London, producing a mapping of each borough — I would like to do something that was presented horizontally and showed the topography in a real sense rather than just alluding to it as Mapping Muswell does. At the moment I am completing work for Kilburn Library using a combination of sculpture and photography, which is a new development for me, combining aspects of the very different architecture that exists in the area, the exhibition opens on the 17 December. 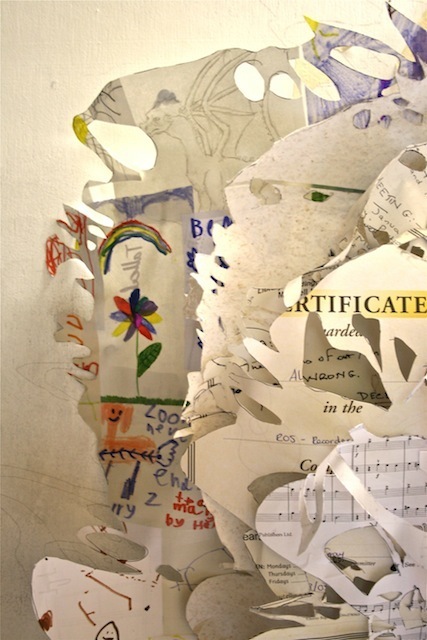 Anya's work is supported using public funding by the National Lottery through Arts Council England.